I always find it both interesting and gratifying when clients who hire me already have their own meter and yet are willing to pay an additional fee to interpret the results. They will call and express concern about either a home they are considering purchasing or one they are already occupying as they are alarmed at the high readings they see on the EMF meter they purchased. 1) It was based on my long experience in doing EMF testing and surveys in the Dallas/Fort Worth area. 2) And what I know about using something other than a high quality meter for making a decision on something as important as where you and your family including children plan to live for the next 5 – 20 years. Now, I am not putting down either the meter, the manufacturer or the homeowner for using this type of meter for a professional inspection. But as you will see in the story I tell, it is more than worth the money to have an expert opinion as a “sanity check” because of the likelihood that you can either get a false positive or a false negative as it were. As you can see in the above picture, the 100XE is set to the 0 – 100 mG scale and is nearly pegged at 100 mG. 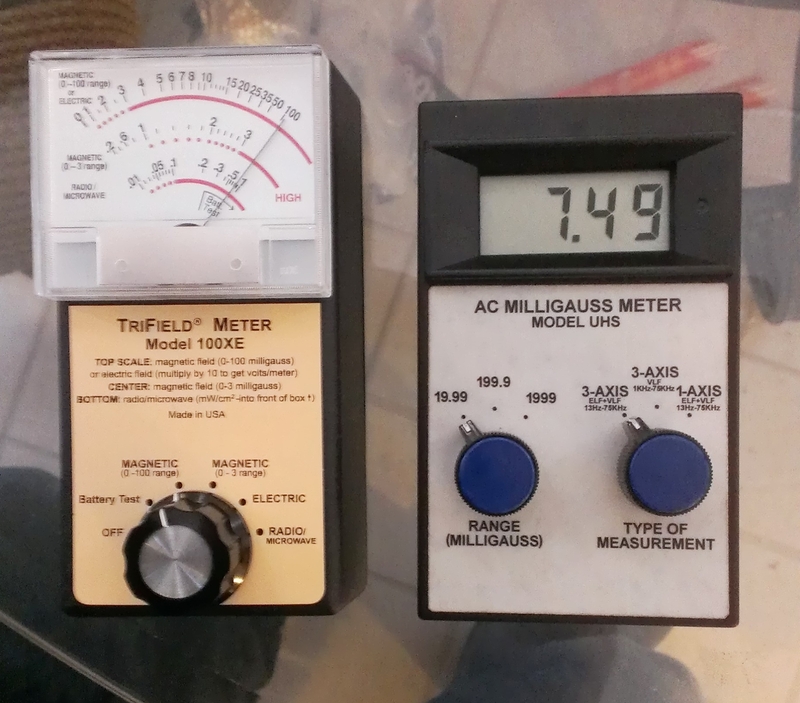 The digital reference meter I use shows nowhere near that level at 7.49 milliGauss. That error is off by more than an order of magnitude which means that the Trifield is reading more than 10 X the amount that is actually present. 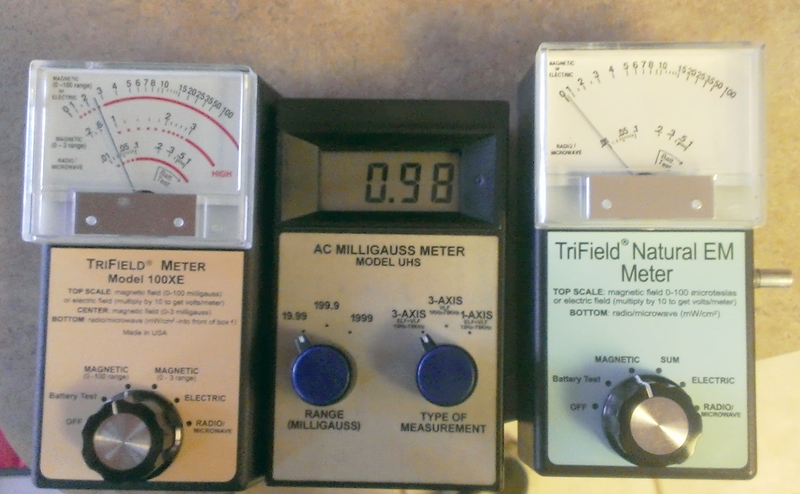 And yes, my meter is calibrated as I periodically check it against another meter. In this case, if the homeowner had merely relied on the meter they purchased online, it would have potentially meant that they would have passed up a home they might have been otherwise happy with based on erroneous information. This is more time and hassle for them, the seller, agents, etc. all based on a faulty needle indication. The second case came a week later with another Trifield 100XE on the scene. In this case, it was not nearly as inaccurate, but it still reads 2.5 mG while the reference meter reads just under 1 milliGauss. Not as dramatic, but still enough difference that a family with young children might have shied away from this property when it was not really an issue. Now as an aside, take a look at the reading of the Natural EM Meter (blue label) to the right. This is one of my personal meters and it reads low at less than 0.5 mG. More accurate, but it is still reading lower levels than what is actually present. So why do I even use this meter? Because one thing I do like about analog meters is that they are good for seeing trends and odd fluctuations – but I never use them for absolute values on a survey. You may think I am saying the Trifields are not any good, etc. but they do have their uses as long as you understand their accuracy limitations. To be blunt, the reason these have become so popular is because of the interest in the paranormal and ghost hunting fields and the ways in which they can be customized with outputs, alarms, backlighting, etc. but these features are not of direct use to a serious prospective homeowner or professional EMF inspector. There is more commentary on this in the following post regarding a technical conversation I had with the manufacturer. At the end of the day, a proper EMF inspection is about more than just reading a meter; it is about having judgment and recognizing errors when they do not fit with conventional experience and wisdom. 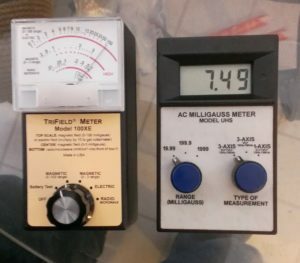 It is about being knowledgeable about the different kinds of meters, single axis vs. triple axis, true-rms averaging and how the frequency range of an individual model of meter can weight the readings differently. It is also about risk assessment, diplomacy and seeing a larger picture than just a scary needle sweeping across a meter face. This entry was posted in EMF Meters, EMF Testing Bio-Electromagnetic Health & Safety Levels and tagged comparison, EMF meter, emf testing, home inspection, levels, powerline inspector, safety on August 22, 2013 by jagman777.